It has been 15 years now since Earthdawn was published. Of course is Red Brick celebrating. Not only with a discount on several books called "The Horrors ate our Margins! ", also some important "supporters" talk about the past and the future of Earthdawn. 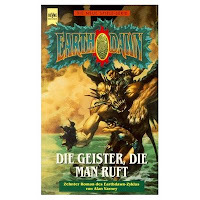 The Earthdawn novel "Piercing a Veil" from Allen Varney was published only as the german translation "Die Geister die man ruft". It has never been published in english, but the english original version of the novel is free available at Allen Varney Homepage. 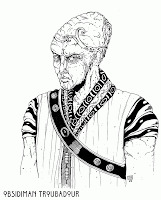 Its a high magic earthdawn story that takes place in Travar. All I can say about the novel: "take a seat and read some pages, you'll love the story!". If you click the picture you'll come to the german review of "Die Geister die man ruft" made by Drosi.de. After thinking about character creation I had in mind to make a post about various ways to create characters in Earthdawn. Then Elidis a reader of my page pointed out, to make a collection of the existing character generators. The major problem for Earthdawn players/gamemasters is to find a character generator for the version they are playing. Existing versions are ED (by FASA), ED2 (by Living Room Games) and finally Red Bricks classic version (the most promising in my opinion). Here's the collection of various Earthdawn character generators. 1. 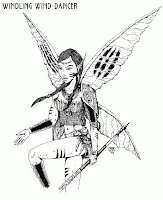 The first character generator EDCG1.3e for Earthdawn came from lostpapers.free.fr (Mirror) and it's based on the rules of the first Earthdawn edition from FASA. It offers a good way to generate characters within minutes. But some special disciplines are missing and the option to give your characters talent knacks is completely absent. Also the printout of your character is not an eyecatcher, it is not like a character sheet, more a listing of character statistics without charts. But if you still use the first edition and want to create a NPC or PC's with few effort, EDCG 1.3e should be good. An update for the EDCG1.3e is offered by SaDe at throal.earthdawn.co.hu and was made by cbooth from the Earthdawn.com forum. This hidden update does a lot, for example adding special disciplines and adding book references to Red Bricks publications. The update brings the EDCG1.3e to Red Bricks classic edition standards, so if you use Red Bricks classic version just add this data and enjoy. Also some language patches are available for the EDCG1.3e, for example a polish [page/link/mirror] and a french [link] language pack. 2. "The Second Step" (Mirror) is the best character generator that exists. It offers everything you need, quick random character creation, talent knacks, a huge collection of thread items and a great spreadsheet printout. Unfortunately it uses the ED2 edition system from Living Room games, which can be declared unconcious or nearly dead. But if this is still the version of your choice, "The Second Step" offers the most comfortable way to create PC's, NPC's and even creatures. Because a special gimmick is the Creature Creator, whereby you can create creatures on your own or use a lot of creatures from the database. Some creatures, talents and other stuff from the "newer" Living Room books are missing, if you download "The Second Step". But over HERE's a link to data files you can embed. So that The Second Step is finally complete and up to date to the ED2nd edition from Living Room Games. 3. Carsten Damm offers at his fanpage ardanyan.de another character generator made by Abrojo for Red Bricks edition. But honestly at the actual state, the program is no solution for gamemasters to create characters. It offers players to build a first circle character in short time, but unfortunately only first circle characters. But I think if it will be extended it could become an useful generator. Let's see what happens in future. 4. A complete different way of character creation is using Excelsheets. They appear in a perfect spreadsheet view and offer a huge database of talents, knacks and spells. I would say almost everything that has been published is included. I chose two very good examples of Excelsheet character generators . The first Sheet is based on Living Room Games 2nd edition. It's made by Critter and is a half-automatic character generator in german. The second Excelsheet is made by Ridcully. It is bilingual (simply change "Deutsch" into English) and is based on Red Bricks alternative discipline mechanics. 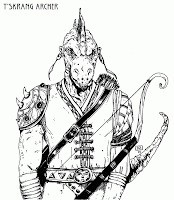 After all, character generators are a good solution for gamemasters to create NPC's and creatures, but for players who create their character I would recommend the traditional way. You will simply get a better feeling for your character when its "born" by your own hand. Note: I decided to provide Mirrors with direct access to the programs and their updates because I want to preserve them. For example the original website of The Second Step is unavailable for unknown reasons. If any author feels disturbed if I provide their programs and updates, please contact me. Special thanks go to Elidis, who inspired and helped me with this post. The voting for your favourite hero ended and the winner is LORM. That's why you all will receive Lorm's character sheet made with EDGC1.3 and The Second Step, enjoy. A member of my group told me to watch the youtube videos from "The Gamers". So I did and you all should do so. Its not Earthdawn related but Roleplayers in gerneral will find similarities. Ok I found two posts in forums that reveal what I supposed all the time. Living Room Games has no longer a licence to publish earthdawn material. One post from James Flowers at rpg.net [link] and one from Dammi at the german forum [link], proof that Living Room Games licence lapsed over one year ago. I don't know what will happen to the books they were working on (Dangerous Goods and Way of Will), maybe they are so kind to spread them as pdf, as FASA did with the dragon sourcebook. But the weirdest thing is that they don't inform their fans in the forums or on their page about that issue. So if you are one of the players that still use Living Room Games 2nd edition, stop crying and think about what to do now. The best will be to buy Red Bricks two sourcebooks and adjust your game one step after another. You won't have to give up playing, just change and make compromises. Introduce everytime you play some small changes and write them down, so that you know what you adjusted. You'll see that a change of systems will be easier than you think. Or you can simply keep on playing the Living Room 2nd edition, but keep in mind that no new material will be published for it. Some of you might know Damien Colice. He's the owner of the website http://www.earthdawn.free.fr/. I think his fabulous paintings should be appreciated, so I decided to make a short interview with him, to tell us a little bit about himself and the french earthdawn community. "Hello, could you short introduce yourself?" My name is Damien and I work in a french RPG company right now (www.black-book-editions.fr). I'm also a musician and play bass guitar in a french rock band, SARRO (www.myspace.com/sarromusic). "When did you start to play earthdawn? Do you play still until today?" Back in 1995. My father was invited by the US government for holidays and he called me one morning to say that he was in a RPG shop and that he didn't find Jorune (the game I asked him to bring back with him !!!). So he ask me what other game I might wanted, and I look quickly in my RPG magazine and found Earthdawn. That's how I get this game ! I started playin' ED very quickly with my friends. But it was tough, as I was 17 yaer-old and not so good in english at the time ! I've never stop playing ED since, and my friends neither. That's our favorite game, simply. "When did you start painting and what else did you paint than this great Earthdawn stuff?" I've always draw pictures, as far as I can remember. But always people, never landscape ! So my capacity are limited ! I did some pictures for ED's Living Room Games (Dragons, Way of II) and for Black Box, the french RPG magazine edited by Black Book editions (illustrations of adventure path and a black 'n white comic strip untitled "Blackman"). Oh, I also made some NPC for the french translation of "Runner Havens" for Shadowrun 4, as the french version has a chapter about Marseille, a french runner haven ! "I know that you painted the cover for the upcoming Sourcebook Kratas: City of Thieves. Could you tell us how you got involved with Red Brick and what works you did for them?" I didn't painted the cover of this book (Kathy Schad did... and did great ! ), but I made a few NPC (remember, I don't like landscapes ;) ). I met James (Redbrick's boss) on the earthdawn website, back at the time of the first announcement of a new version of ED. He's a very very kind and respectful guy, and I'm looking forward to met him in real life (which could happen in Essen this year). Actually, Black Book editions is about to edit the french version of Redbrick's Earthdawn, so we work with James and I've always tell him that if he wants pictures of me, I will make them. The work of Redbrick is so amazing. Kratas is gonna be a very nice ED book ! "How about the french community of Earthdawn fans? Are you involved in it and how huge is Earthdawn in France?" I was an active fans for years (my main topics were : crossover ED/SR and Prelude to war ! ), but now that I work in a RPG company, I have less time, but the french ED community is active, and the game is popular, even though the firts french editor (Jeux Descartes) did not do a very good job with the line (bad choice of product going to translation - for exemple, thay never translate the Denizens of Earthdawn nor the Adept's way -, bad change of the cover design, etc.). I think that Earthdawn's Redbrick can be very successful in France, because the system is now very clean (which was one of the main problem of the first edition) and because people know that the background of the game is one of the best of all. "Thank you for the short interview." Thank you very much ! And sorry for my english, I try my best !